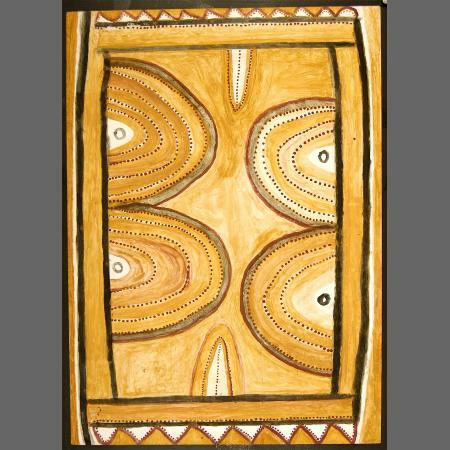 This painting features the Dreamtime story of Jawurranji, the moon, and Daawul, the black headed python. This story comes from the Garndiwal part of Gija country around Lansdowne station. Darreninjiwa is the Gija name of Godford gorge on the Leopold River. This is where the moon called out to the promised wives. Mawunay(in) is the big waterhole at the bottom of the gorge, where all the promised wives were gathered. Dawyan Dawyan is what the moon said when the people asked him which woman he wanted as a wife. It means roughly 'this one, this one' and is not proper Gija. Barljaninyin is the name of a 'window', which is a gap between two hills near old Colass Station. Barljaninyin is in the Garndiwal part of Gija country. There are bullock paddocks on either side of the 'window' and one has a bore. Barljaninyin is right near the homestead of an old station called Colass. This was Tommy Magic's place. He had many dogs and ran the station by himself. Mick Jawalji worked there branding cattle and sterilising cows. The place where Colass homestead was is called Wuruwa in Gija.